I’m passionate about every child in Great Britain learning to swim, and it's essential we have the right quality swim teachers to deliver fun and high quality lessons. 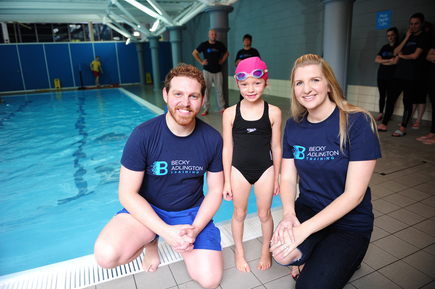 After setting up Becky Adlington's SwimStars, now teaching over 8,500 children to swim each week on our core programme and a further 2,000 on our national curriculum programme, I am determined to provide the best possible training for individuals to teach swimming with maximum confidence and skill. We focus solely on Swim England Level 1 Swimming Assistant (Teaching) and Swim England Level 2 Teaching (Swimming) to ensure we focus primarily on the training and development of great swimming teachers first and foremost – we also run them as a combined course. It’s well known in the aquatics industry that there is a shortage of top class swimming teachers in this country. When we were confronted by the latest Sport England statistics about the serious drop in the number of people actively swimming, and the worrying fact that most pupils starting secondary school this year cannot swim (despite it now being a National Curriculum requirement for primary schools to deliver this), I knew there has never been a more important time to develop the next generation of swimming teachers who can start to reverse these trends. I see Becky Adlington Training as something more than simply getting people through their qualifications. A swimming teacher is not there just to pass on their technical expertise, they should be a role model for their pupils, demonstrating a passion and commitment to teaching people to swim. A good teacher is someone who you remember for life - not just the duration of a course. This ethos will run through everything we do at Becky Adlington Training. That’s why we are using the best tutors in the business, to train the teachers who want to make swimming fun, and inspiring, and safe for thousands of young people each year. My own SwimStars schools have benefitted greatly from the time and thought I took to develop these programmes with Alan Rapley and Linda Freeman, two well respected and experienced Swim England trainers, with knowledge and experience of Learn to Swim programme development and delivery. We devised a programme where teachers are able to take extra time to make the classes enjoyable and fun - as well as following the Swim England Learn to Swim Pathway - and it is making a real difference in our success rates. We are committed to helping you achieve your goal of gaining the right qualifications, building a career in aquatics, and changing people’s lives.